STYLE GUIDE: Here's a hunk of artistic Apple hackery that should be featured as the main attraction in a trailer park Mac museum. Made from what looks like the combined parts of an old iMac and PowerMac G3, this brilliantly awkward lamp creation is sure to add epic flair to any room in the double-wide. The "Blueberry Wave" is classic junk yard chic that still manages to offer a proper homage to Dr. Frankenstein. It's painfully difficult to remember what it actually looked liked in a former life. One of the lamp's best features is its locking hatch on top which allows easy access to the bulb inside. That's where the magical feelings end. If you're looking for that one-of-a-kind gift for the committed Mac enthusiast in your life, you may not want to pass up this opportunity to let your lovelight shine. How much would you pay to cast various shades of Apple blueberry blue around the room? Expect to pay $45 dollars plus $15 dollars shipping in the US. Compared to Apple's iPhone 3G device in OpenGL benchmark testing, the graphical abilities on iPhone 3GS have received a considerable upgrade according to the results posted on GLBenchmark. Exactly how much of an upgrade? The benchmark test was running OpenGL ES 1.X which means that even more impressive 3D graphics can be expected in the near future since iPhone 3GS is capable of running OpenGL 2.X, as identified in a great post by Ubergizmo. The two other devices compared in the test were iPhone 2G and Nokia N95 8GB. While claims of better iPhone graphics and faster CPU performance get tossed around like ecstasy at a Lady Gaga concert, it's good to finally see some intelligent data. I'm anxious to experience the reality of the epic 3D game titles developed for iPhone 3GS that are still to come. The future of iPhone gaming is getting brighter by the moment. The "S" stands for speed. Tweet that broseph! Here's a simple modification for turning any Contour brand case ($30) into a sturdy iPhone tripod mount. This do-it-yourself design by Scott Patrick is a fairly cheap solution for the serious video geek. I like the idea of using an iPhone case that adds extra protection should some duck-footed, wonder-klutz kick the tripod while your device is mounted. The only objection I have is that I prefer to shoot video in landscape perspective rather than portrait. Which appears to be an easy adjustment with Scott's mod seen here. I guess you can always use the tripod for the landscape tilt. Even so I have little use for video in portrait mode. Before you rush out to an Apple retail store fully armed with your Master Card aimed at a new iPhone 3GS, you may want to check online first. Apple has re-launched its wildly popular iPhone availability checker online allowing a detailed stock check before you pounce on your local store. Apple promises that iPhone 3GS availability is updated hourly online and that fresh stock arrives most days. Simply select your state and a list of Apple retail stores will appear with either the dreaded "red square of instant death" or the "green circle of joy". Green means go while red means hell awaits you. You can always save the hassle and order online. I noticed that Oregon, Utah and Alabama stores are already "sold out" of all iPhone 3GS models, though most of the other 200 Apple retail locations are not. Happy hunting! SYDNEY - iPhone 3GS launched in Australia to bursts of cheers whipped up mostly by anxious Apple store staffers awaiting doors to open at 8:00 a.m. inside the George Street Apple store location. Hundreds of iPhone faithful waiting in line were clapped into the store by a wall of gawking employees. Who's excited? It became obvious in the video that Aussies are not about to be swept up in the fabricated hype delivered by those wild-eyed Apple-bots in the blue and orange tee shirts. Calvin Park, who stood in a massive Apple store line last year for the launch of iPhone 3G, knew it was only a rehearsal since Park chose not to purchase a phone in 2008. This year would be totally different. "I can't think of any other word to describe it - it just feels great. I've been waiting for this one for a year." Park told The Sydney Morning Herald as he choked back tears of pure joy and exhilaration. For those of you who've been sleep navigating the interwebs lately, you may not have noticed that Fake Steve Jobs has reclaimed his blogging throne and he's back with a vengeance. His latest skewering is trademark brilliance entitled, "Jon Rubinstein now says he'll get a new liver, too". The great fake one mercilessly lampoons Palm's CEO in classic Jobsian style while reducing the Pre device to a polished turd. El Jobso goes on to congratulate Rubinstein's team of ex-Apple traitors with a huge bat as he freely serves up laugh outloud, backhanded compliments about the Pre like breath mints at Gilroy's annual garlic festival. Lavishing on the device the kind of copy-cat praise it truly deserves. Only a few days after I ordered myself a lightweight, table-top tripod from Hong Kong to capture video reviews with my new iPhone 3GS, videophile Eddie Breen, burst onto the scene with a simple tripod mount mod made from a Bracketron Dock-It cupholder mount kit. Breen became obsessed with creating a real tripod solution for his iPhone 3GS that would match his "exceedingly high photographic expectations." Carving out the plastic tripod screw from a broken Nikon Coolpix he had lying around, Breen attached it in a crude but workable fashion to the baseplate of his Bracketron dock. The results of his do-it-yourself franken-pod mount are impressive, requiring no modding to the phone's body at all. "Maybe someone already offers this tripod mount for sale somewhere - I don’t know." Breen wrote on his blog, "I did an exhaustive search for about an hour, and couldn’t find anything, so I just made one myself." Though Eddie's modification may be glorious overkill for an iPhone mount, the idea is still slick and useful, providing ample shock absorption should he decide to produce a high-impact, action thriller video for YouTube. Until my epic iPhone steady-cam mount is finished, I'll stick with the table-top tripod I bought on Ebay for $2.99. Check out the entire do-it-yourself process on Eddie's blog. If you haven't given the app Boss Attack a proper eyeballing yet, here's your big chance broseph. This $.99 cent app is simple, stupid fun for anyone with half a brain. I could actually feel myself getting dumber after playing Boss Attack for almost ten minutes. The idea of turning anyone's face into a moving target makes this app my current favorite. Choose a photo from your iPhone library or snap one to use on the fly. I chose Iran's President Ahmadinejad, pop icon Susan Boyle and Steve Jobs as my victims. Pelting Susan Boyle with pies to the head over and over was just too wicked to resist. See it all played out in my iPhone 3GS video review after the break. CUPERTINO, CA - Steve Jobs has officially returned to Apple's Cupertino campus according to a report by Jim Goldman, the Silicon Valley Bureau Chief for CNBC. While Apple is still not commenting on the news with an official statement, ol' Jimbo seems certain because employees are confirming that Jobs was there on Monday. "The news is solid. Jobs is back in the house, at least for today." Jim Goldman wrote in his post for CNBC. Meanwhile, Reuters is reporting that "the deity" himself was spotted leaving Apple's Cupertino headquarters in a black car along with with "two men in black suits". a sighting that sounds suspiciously like it could have been Will Smith and Tommy Lee Jones filming a super-secretive scene from a new "Men In Black" film where aliens attempt to kidnap Mr. Jobs. 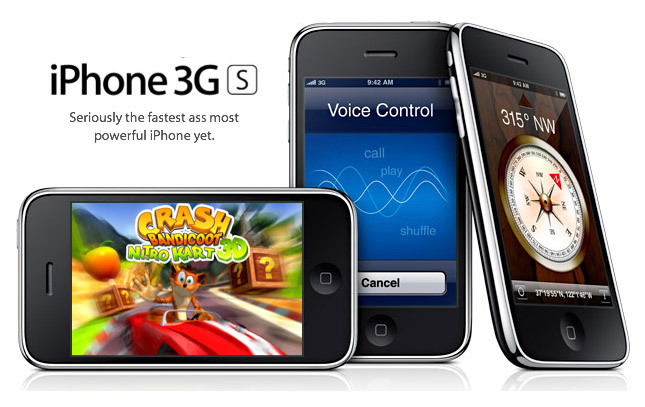 CUPERTINO, CA - It took only three days for Apple to sell one million iPhone 3GS devices according to a press release issued by the company on Monday. The sales figures being reported do not yet include the newly-priced $99 8GB iPhone 3G, once tallied into the totals this past weekend could represent Apple's most successful product launch to date. News that's certain to deal a crippling blow to the Palm Pre hacks. Analysts like Piper Jaffray, estimated roughly 500,000 iPhone 3GS handsets would be sold over the first weekend, but the results were far more robust than anyone had originally anticipated.